Ordinance No. 18, Series of 2011- An Ordinance penalizing any unauthorized person who will breach fire. Ordinance No. 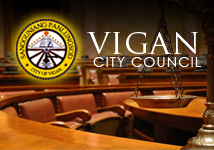 24, Series of 2014 - Ordinance prohibiting the use of cellphones while driving a vehicle in the City of Vigan. Ordinance No.10,Series of 2006 - Requiring the Submission of Contingent Plan for stage concerts, shows or any event. Ordinance No.21,Series of 2005 - Curtail the sale of manufacture of counterfeit drugs and pharmaceutical products. Ordinance No. 24, Series of 2005 - Regulating the purchase and sale, trade in of mobile phones. Ordinance No.25, Series of 2005 - City ordinance on disaster management. Ordinance No 1,Series of 2001- Requiring the Operators Owners of water. Ordinance No 2, Series 2001 - Reorganizing the Vigan City Anti-Drug Abuse Council. Ordinance No 3,Series1999 - Regualting the carrying of Firearms concealed or openly. Ordinance No 8,Series1994 - 1994 Public Safety Code of Vigan. Ordinance No 9,Series of 2003 - Creating the Vigan Dangerous Drugs Administrative Board. Ordinance No 13, Series of 2002 - Requiring Govenment and Pivate Establishments. Ordinance No 16,Series 1997 - Regulating the sale and possession of toy gubs that look like real guns. Ordinance No. 23, Series of 2015- Ordinance requiring PUB and PUV to be equipped with First Aid Kit.